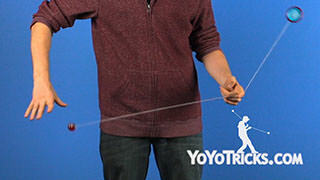 Learn the basic Independent Tangler, which is an introduction to all freehand tangler tricks. To perform this trick, first you are gong to want to start with a breakaway. Rather than landing it in a trapeze as we usually would, instead we are going to let that breakaway just come down on top of our opposite hand pointer finger. Then we are going to want to pinch the string right above the yoyo, loosen our grip on the counterweight and let the counterweight slide down, then you will notice that we have these three string segments. You want these three string segments to be roughly equal in length. The next thing you want to do is take a look at how you are pinching the string. 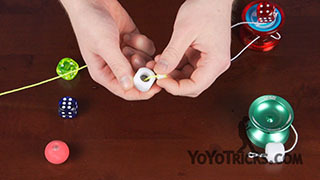 You actually do not want the string wrapped and looped over your pointer fingers. Instead you want to pinch it between your thumb and your pointer finger and that is going to matter a lot later on in the trick. 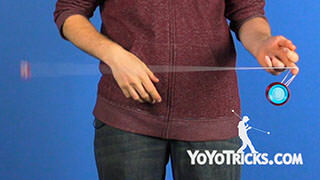 Once you have your string proportions right and the pinch is correct, then we have to take a step forward, a small step forward, with our throwhand foot, so that we can put the yoyo into the proper plane against our body. 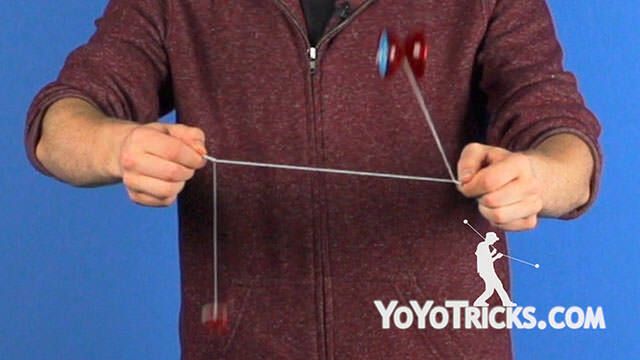 Then you want to swing the yoyo and the counterweight out and then up and over the string so that you are starting two pinwheels. 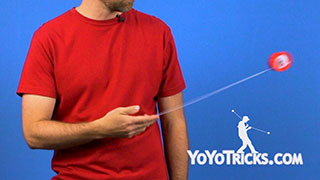 This is the most basic form of independent tangler, and there is a couple of things that you want to keep in mind when you are doing this trick. 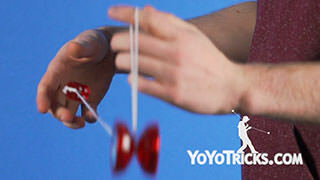 The first thing is that you want the planes of the yoyo and the counterweight to be perfectly parallel. If one is crossing over the other then you are going to get a knot, and the trick is not going to work properly. 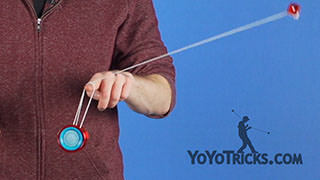 The second thing to consider is that because the yoyo and the counterweight are going around that middle segment that is not moving, you are getting all these wraps on the middle segment string, and you will see how these wraps are nice and clean and organized, and that helps the pinch come undone later. That is because I am pulling that middle string segment tight and taut, so that it is nice and clean. If I keep the middle string segment loose, the string will double or triple over itself which will cause you to get a knot. 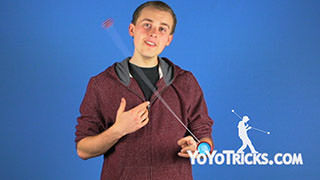 So once have those two things in mind, you just want to practice mastering this basic trick and if you are having a hard time doing this, especially if you are a new 5A player who is not used to controlling the yoyo and the counterweight independently, you can actually practice this trick with a dead yoyo and the trick will work just the same way. Once you have learned the first part of the trick, it is time to start thinking about how we are going to perform the butterfly stall. This can be pretty tricky because you have to move your hands in opposite directions and if you are not used to doing this, your brain signals kind of mixed up on the way to your hands, it is kind of like rubbing your stomach and patting your head at the same time, it is just difficult. But, we have some good tips for you that should make that motion click, so let’s start there. 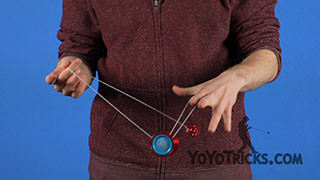 So first things first, you want to think about what you are going to be doing with the yoyo. This is the part of the trick where we are actually stalling, so when you are doing your pinwheels, just like how we taught in our basic stall video, you want to move your hand in the direction the yoyo is going, and then you can pull back and reverse the direction of the pinwheels. So that is pretty easy. Now it is time to think about what we are going to be doing with the counterweight. Throughout this whole trick the counterweight is actually always doing the same thing. You are never going to reverse the direction, you are never going to change the direction, you just want to focus on keeping that counterweight nice and in plane. 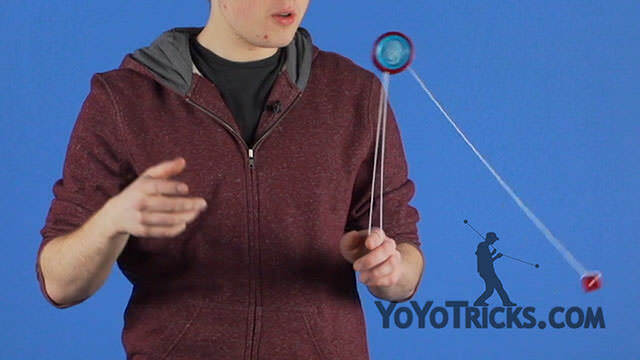 So it is really important that you have this counterweight pinwheel motion down cold, because you want to be thinking about this as little as possible so that you can be thinking about the yoyo as much as possible. One thing that really helps keeping the counterweight spin consistent is keeping your throw arm really stiff and rigid, not moving your throwhand at all. When you are doing the butterfly stall itself, you want to keep your throwhand rock solid right where it is and only move your non-throwhand to stall the yoyo. So I am not bringing both hands forward to stall, I am only bringing my non-throwhand forward to stall it. Once you have that down, and it might take a little practice, now we need to think about how we are going to dismount from the trick. To do that, first we are going to think about the counterweight, and just like how we taught you to catch 360, you want to take these bottom three fingers and stick them towards yourself. 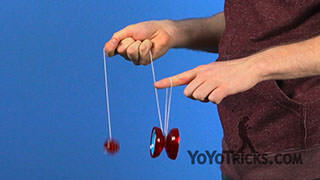 Then you want the counterweight string to come over those three fingers. Then you can drop the pinch, catch the counterweight, and pull out. 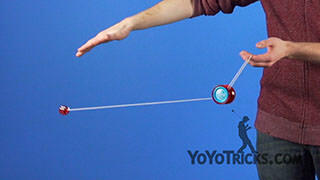 So, we are going to do the same thing but in the opposite direction with the yoyo. 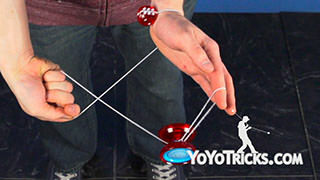 After the butterfly stall, you are going to stick out those three fingers and let the yoyo string come over top. Then you can let go of the pinch and you can stick out your pointer finger. 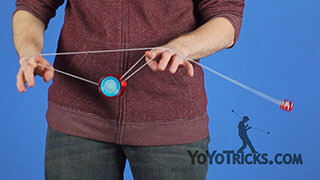 Because the yoyo is already going in that direction, you can go into an undermount and perform a bind. 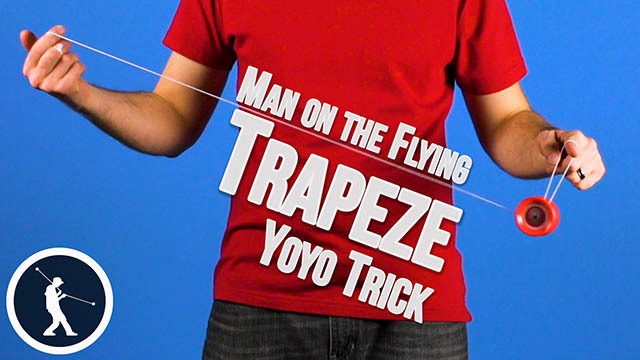 If you are still having a hard time learning this trick, it is a difficult one, you can practice it with a dead yoyo, but remember that the true trick is with a spinning yoyo. And that is the independent tangler. So now that we have mastered the basic independent tangler, now it is time to work on adding the butterfly stall. 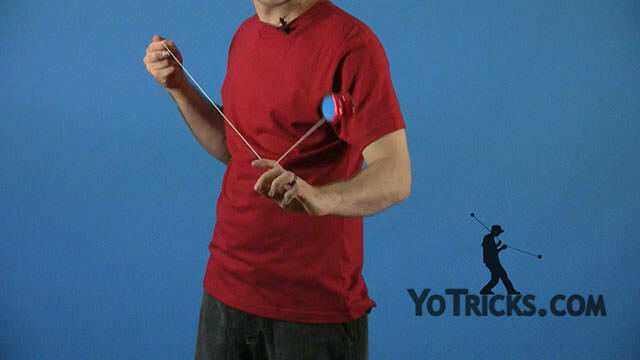 And this… can be pretty tricky because the yoyo can fly right out of your hand and that is just no good because then you can not do a bind because the yoyo is not in your hand. Come on, get with the program. 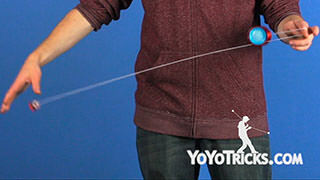 Because the yoyo is already moving in that direction, you can go into an undermount and perform a bind. 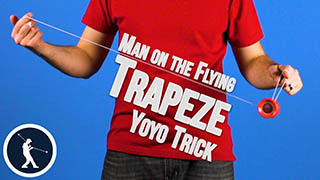 And that is… I forgot the name of the trick! (It’s an independent tangler.) Independent tangle – that is independent tangler. (and we forgot something) What?